People with autism can often think the way animals think, which puts them in the perfect position to translate "animal talk." 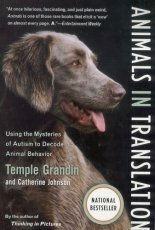 In this groundbreaking book, Temple Grandin draws on her own experiences with autism as well as her distinguished career as an animal scientist to deliver an extraordinary message about how animals think, act, and feel. Funny, informative, and full of incredible insight, Animals in Translation will forever change the way we look at our fellow creatures.